Why a report on castor oil? Castor oil is one of the most versatile plant oils. Its unique chemical structure makes it useful in a wide number of industries and applications. Castor oil is fast becoming one of the most sought after plant oils, owing to its rich properties and variety of end-uses. Currently, it is being used by industries from pharmaceuticals to lubricants. With biopolymer and bio-fuels industries picking up a lot of steam in the last couple of years, the potential for castor oil to play a much larger role in the world economy had increased dramatically. While the castor oil industry is over five decades old, there has been considerable interest shown in this industry in the last few years. Leading countries from practically every continent (North & South America, Europe, Asia, Africa and Oceania) are showing renewed interest in the castor crop. While the importance of castor oil has thus increased recently, there is no comprehensive report that addresses all important aspects of castor oil. 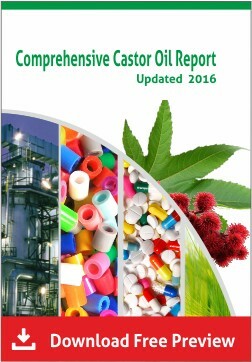 CastorOil.in, the premier online resource for all things about castor, has hence brought out this report to assist all the professionals in the industry. What is exclusive about this report? There is no other comprehensive report available for castor oil anywhere in the world. This is the first of its kind, and currently, the only one. CastorOil.in has been interacting with a number of castor oil industry participants for many years now. This list includes manufacturers and processors, castor bean cultivators, castor oil and castor oil derivative chemicals users, economists, machinery suppliers and trade bodies. Using this collective intelligence and inputs gained over these years, CastorOil.in has prepared this comprehensive report. If you are interested in purchasing the report or getting our help, talk to us now. The report will be sent to you within one business day of payment. Report purchases made during saturdays, sundays and other hoildays, will be processed on the company's next business day. What is the current and future potential for castor oil and castor oil derivatives? What are the various derivatives of castor oil and their applications? What are the manufacturing processes for various castor oil grades & derivatives? Which are the prominent companies worldwide for castor oil and derivatives? What are the prospects of using castor oil for biodiesel? What is the status of castor oil use in biopolymers production? What are the demand and supply scenarios and the market potential for the various derivatives of castor oil - now, and in future? What is the scenario of the castor oil industry in India, the largest supplier of castor oil in the world? What are predictions for the future with regard to challenges, possibilities and breakthroughs? What are the next steps an entrepreneur should take should she/he be interested in exploring further? Why should you buy the Comprehensive Castor Oil Report? It provides insights from industry professionals worldwide. The goal of the Comprehensive Castor Oil Report is to present an objective status report on the current and future potential of the castor oil industry. Written by professionals who have been observing the industry for many years and who interact continuously with all the key industry players, the Comprehensive Castor Oil Report will assist you to clearly understand the potential and prospect of the industry. Castor oil production - volumes, values - provides details on the countries that produce castor oil and the volumes they produce. This section has a special focus on India as this country is by far the largest producer and exporter of castor oil. Castor cultivation - provides specific details on the castor crop cultivation, soil, water and climatic requirements, on types of seeds and hybrids available, typical yields. Castor oil end-uses - provides details on the current and future possible end-uses and end user industries of castor oil. Biopolymers and castor oil - this section has a specific focus on the future possibilities in biopolymers (such as bio-polyurethane foam) for castor oil. Demand-supply situations for various castor oil grades & derivatives - Provides current & future demand-supply estimates for the various grades of castor oil and their derivatives. This will be very useful for entrepreneurs exploring opportunities in the vegetable oils / plant oils domains. Castor oil manufacturing is similar to that of other oil seeds and hence the oil can be manufactured utilizing the existing equipments that are locally available. The castor seeds contain about 48 to 50 percent oil by weight, and the extracted castor oil can be further processed to derive a number of derivatives, currently used in numerous industrial applications. India has exported a record high of nearly 400000 tonnes of castor oil in 2010 as a result of heavy demands from importers abroad. During 2011, oil export has fallen significantly due to high cost of raw material and reduced imports from countries like China and USA. India contributes about 1.5 million tons of castor seed with and over 500,000 tons of castor oil to the world total production during 2011-12. The annual domestic consumption of castor oil in India is only about 120,000-140,000 tons in the same period. Of this, the soap industry consumes about 25,000 tons, the paint and allied industries 35,000 tons and the lubricant and derivatives industry 20,000 tons. The global market for generation II castor oil derivatives is estimated at about $300 million. For generation III derivatives, where half of the generation II derivatives are converted, the estimated market worth is close to $350 million. Paint industries greatly rely on resins derived from castor oil to occupy 20% of total domestic consumption in India. Cosmetics, perfumeries and rubeer & plastic units consume it equally and castor oil driven chemical derivatives help them to manufacture diverse personal care items and bio-polymers etc. As pharmaceutical and others like biofuel units currently produce only limited goods with castor oil, they occupy least share in domestic usage of this industrial oil. While castor oil is popular in itself, its various derivatives and their unique properties and consequent applications make castor oil even more important in the plant and vegetable oils hierarchy. While castor oil by itself is used in diverse applications, chemical derivatives of castor oil find further uses in industrial applications and their domains of use are increasing rapidly. Like other vegetable oils and animal fats, castor oil is a triglyceride, which chemically is a glycerol molecule with each of its three hydroxyl group esterified with a long chain fatty acid. Apart from ricinoleic acid, the other fatty acids present are linoleic (4.2%), oleic (3.0%), stearic (1%), palmitic (1%), di-hydroxystearic acid (0.7%), linolenic acid (0.3%), and eicosanoic acid (0.3%). European Union imports over 1,00,000 tons of castor oil annually, and almost all its imports are from India. Fuerst Day Lawson is one of the leading Castor Oil suppliers in Europe with over 40 years experience buying directly from the producers in India, China and Brazil. The company supplies castor oil into Europe and China, selling approximately 40,000 MT per year via storage tanks in Rotterdam and Marseille, and via direct deliveries in flexitanks and drums. Because of its higher polar hydroxyl groups, castor oil is not only compatible with but will also plasticize a wide variety of natural and synthetic resins, waxes, polymers and elastomers. Castor oil and its derivatives today find major application in soaps, lubricants, grease, hydraulic brake fluids, paints, polymers, perfumery products, surfactants, surface coatings and inks, telecom & engineering plastics, pharma, rubber chemicals, polishes, flypapers, and cosmetic derivatives. Companies such as BASF produce plastics from renewable resources which contains about 60 per cent sebacic acid – a derivative of castor oil. The world's largest single use of castor oil in one product, outside the lubricants markets, is in the manufacture of polyamide 11 (Nylon 11). The commercially available polyamide made from castor oil is Arkema's (earlier Atofina) Rilsan Nylon 11. The castor oil market price experiences significant volatility. Uncertain oil supply, recent development of substitutes, long storing periods & hoarding are the main reasons for the price fluctuations. In spite of these factors, there is invariably a minimum quantity of this commodity that is consumed annually by advanced countries. The most suitable soils for castor are deep, moderately fertile, with slightly acidic conditions, well drained, sandy loams. The fertilizer dose recommended for castor is 40 N-40 P-20 K kg/ha. The minimum rainfall needed by the castor crop is 38-50 cm (15-20 in.) Some of the high yielding castor varieties used in India are NPH-1 (Aruna), GAUCH-4, and TMVCH. While castor is an important crop known for its versatility of uses, in many parts of the western world, including the US, the crop is not planted on a large scale. The main reason for this is the ricin, a toxin present in the seed coat. Besides the ricin toxin, there's another compelling reason why this crop has fallen out of favor with growers. The shiny, beetle-shaped seeds contain powerful allergens. People who work with the off-white meal ground from castor beans may develop allergic reactions, such as hives or asthma. Castor beans are graded based on moisture content, percentage of cracked and broken seeds, and amount of foreign material. The allowable moisture content is 6 per cent. Average seed yields range from 900–1000 kg/ha under irrigation, and 500 kg/ha without adequate moisture. Some improved open-pollinated varieties in Brazil yield 1,300 kg/ha, with exceptional yields up to 5,000 kg/ha. Average Indian yields are about 1000 kg/ha. Under exceptional circumstances in the state of Gujarat in India, seed yields of 6000 Kg / hectare have been recorded, but it should be noted that these yields have been registered only for some limited growth areas. India exported approximately 3,40,000 tons of castor meal in 2011-2012. About 1,00,000 tons are consumed within the country, in the form of fertilizers and as fuel. Energy Alternatives India (EAI) was founded by IIT and IIM alumni to accelerate the adoption of Renewable Energy and Cleantech in India through expert consultancy services, critical business intelligence, and in-depth research. Our reports and solutions are highly sought after by policy makers, large and small industries, and growth-seeking renewable energy companies. Read more about our work and our clients.